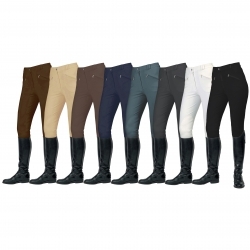 Mark Todd Ladies Coolmax Grip Breeches - Description:Made from Coolmax fabric these breeches are a great addition to any horse rider?s wardrobe. Coolmax is a highly technical fabric which has temperature control and wicking properties making these breeches perfect in any weather. Featuring a silicone grip knee patch, sock ankle, belt loops and Mark Todd embroidery.Colour: Beige, Grey, Navy, WhiteSize: 24" to 34"